Panorama has reported from Iran over the past 50 years, from her days as an ally of the West under the Shah to the more troubled relationship we share today. Watch abridged moments from some of those films here. As Iran grew in strategic importance, Panorama visited Tehran in February 1961 to ask how stable an ally is she? The 1960s saw the beginning of the end of dynastic rule in Iran. But the emergence of modern Iran can be traced back four decades earlier to Reza Khan, who brought the Qajar dynasty, which had ruled Iran since the late eighteenth century, to a close in a 1923 British-backed coup. With Reza Khan taking the throne in 1925, the Pahlevi dynasty was established, but was to span just two monarchs. Between the two world wars, the Shah, as Reza Khan was known, quickly pursued a modernising agenda. However, during World War II, and despite Iran declaring its neutrality, the Allies suspected the Shah of siding with Germany. As a result, Russia and the UK occupied Iran. Reza Khan was forced to abdicate and the Allies replaced him with his son, Mohammad Reza Pahlevi. Power struggles ensued between the Shah and a Qajar aristocrat and intellectual, Mohammad Mossadeq. Mossadeq was appointed prime minister in 1951 and led a popular campaign for the nationalisation of Iran's oil. In 1953 the Shah was forced to flee the country but returned to the throne following a coup sponsored by US and British intelligence agencies in which Mossadeq was ousted. This marked the start of US influence on Iran. The newly installed Shah, Mohammad Reza Pahlevi, pursued his father's social and economic modernisation programme and became the first Muslim leader to recognise the state of Israel. He focused his efforts on consolidating ties with the US as well as his immediate neighbours. His modern vision of Iran enjoyed some success and the status of women and religious minorities improved. But his reputation was marred by his excesses. Corruption and cronyism were rife. He repressed political dissent and took power away from the clergy and conservative merchants, fuelling his unpopularity. That he was able to suppress dissent was in no small part due to the loyalty of the army. Among the Shah's critics was a Shia cleric, Ayatollah Ruhollah Khomeini, who opposed the Westernisation of Iran and the country's ties to America. He wished to overthrow the monarchy and replace it with clerical rule. His outspoken opposition led to his forced exile in 1964, but taped sermons continued to be smuggled into the country as Khomeini continued to build on his vision of an Islamic state. 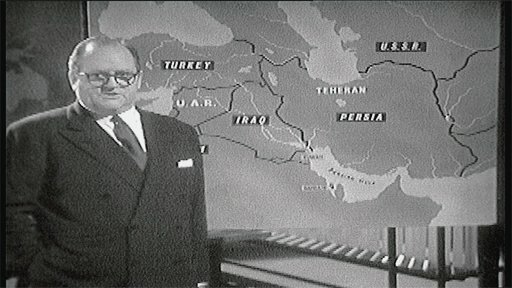 In 1961, Panorama visited the country to ask just how stable and secure the Shah was, as the West's view of Iran's strategic importance continued to grow. Panorama: Obama and the Ayotallah, Monday, 8 June, BBC One at 2030BST. Watch Iran Archive: 1993: Arming for Islam?